Stylin in St. Louis: Spotlight of the Week: Winter Brights…. Spotlight of the Week: Winter Brights…. Happy Thursday! This past weekend, we had great weather so my husband and I went to the outlet mall to look for clothes for him to wear to work. I wanted to be comfy, so this sweater and leggings were perfect! Come share your winter brights with Elle and I! 1. We kindly ask that you follow the two hosts: Elle from Living in Color Style and Jacqueline from Stylin' In St. Louis via Bloglovin or GFC and of course our co-host Lawren of Saltwater and Stilettos . Spotlight: Our spotlight this week is Osy of Style Diary By Osy! 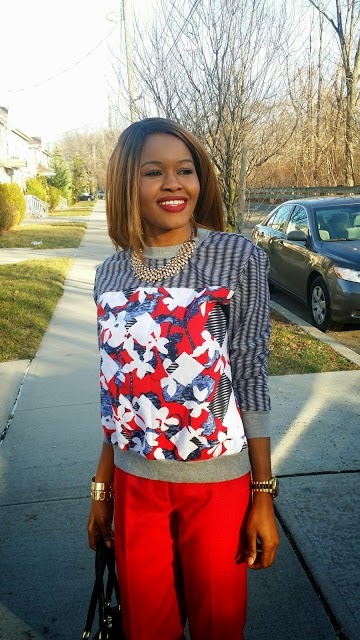 Osy's sweatshirt is such a fun and colorful print! Such a great way to dress up a sweatshirt! Be sure to check out her blog! Love the leopard flats, such a cute look perfect for shopping. Love the bright sweater & the pop of leopard, the layering is super cute too!! Love the red sweater and the leopard pop! Such a cute, casual look! Love that J.Crew sweater! I wished I had bought it at the time. It looks great with your leopard. Love your layering and the color combination. Your hair is so perfectly effortless. Winter can be so dull so dressing it up with bright colors is so fun! Love your sweater!! You look absolutely adorable in that bright sweater! Loving the casual/chic look! Something about red & leopard is just perfection! Love your outfit and hope you found some goodies for yourself too. Love your bright colors here! Your hair looks fab, too! Brights always look great on you! I really like the chambray shirt untucked, too!! I looove winter brights! This sweater is so pretty and those flats are adorbs! So adorable! Love love that sweater! Loving this look! As dreary as winter can be a pop of color is spirit lifting! The red is gorgeous! You look absolutely gorgeous in red! I wish red looked as good on me as it does on you! I love love love adding pops of color in the winter! This is such a pretty look! So smitten with your gorgeous studded bag! The black and red combo is stunning. Looking lovely! Red and leopard is my fave!